Dinner last night came together quickly. Sunday evening I prepared a tuna salad to have for lunches (or dinners) during the week. So very random I am aware, but it actually tasted good! 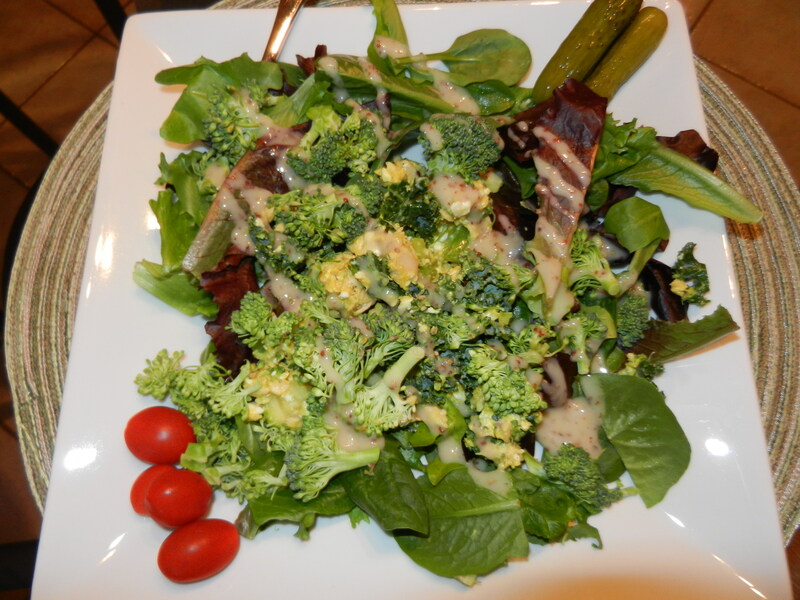 I served this salad on top of mixed greens and added some fresh broccoli and grape tomatoes. I finished it off with my favorite Newman’s Own Honey Mustard. I also ate a piece of bread with grape jelly and a dark chocolate adora disk dipped in Smart Balance peanut butter. This morning, breakfast was waiting for me in the fridge. 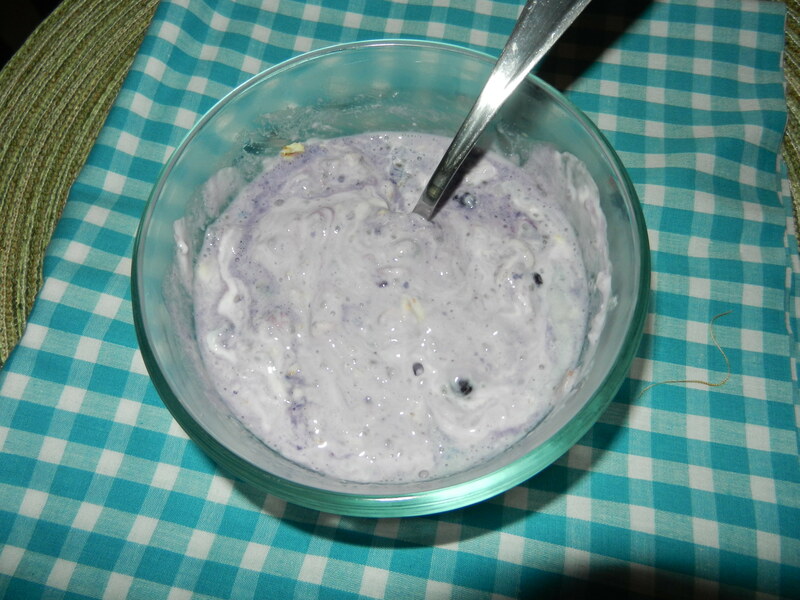 Last night, I mixed together a small amount of oats, Fage non-fat greek yogurt, almond milk, chia seeds, and blueberries and refrigerated over night. This morning I gave the mix a good stir, added a bit of honey and banana and ate a breakfast of champions. It was so creamy and just the right amount of sweet. It really hit the spot. As you may know, I am registered for my first half marathon on June 3rd, 2012 in Minneapolis (Dana is also registered). Throughout the winter I maintained some of my running endurance by hitting up the treadmill a few times a week, however my boredom hindered me from accomplishing anything further than 5 miles on the treadmill. I decided that any distance longer than 4 miles was going to have to wait until Spring rolled around so that I could run outside (remember I am a big freeze baby and don’t like to run outside in the cold winter). Now that Spring is here, it is time to reevaluate our half marathon training plans. Originally, I had found one by Hal Higdon I liked, and Dana had found one by Jeff Galloway that he liked. Could we both train on separate plans leading up to the big day? Surely, but it would be a whole lot easier if we trained on the same plan, that way we could run together and keep eachother on track. In either plan, we would have our long runs on the weekend so we could at least run together on Saturday, which in retrospect would probably be the only run that we would be able to do together unless I started running after work. That’s a whole other bag of worms: my total dislike for running after work. I feel like that is when I am the most sluggish. I prefer to run in the mornings but that doesn’t always happen either! What I do like about Jeff Galloway’s plan is that he only has you running 3 mile runs on Tuesday and Thursday for the most part, which, in working around a work schedule, seems like the nicest option. However, I don’t know if that is enough mileage for me. I am at such a crossroad and sort of don’t know what to do. I know it is an option to adapt pieces I like of each and make it work for me, and that’s probably what I will end up doing. Any thoughts/tips/advice from runners out there would be greatly appreciated! Basically, I just need to get my booty in gear and make some decisions so I can move on with the training. June 3rd is not that far away! Yikes! 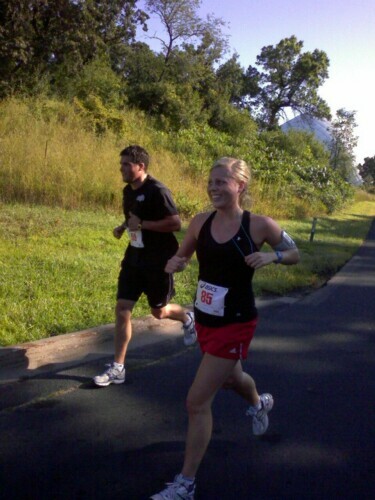 This entry was posted in Breakfast, Dinners, Training and tagged FAGE, Half Marathon, Running, Salads, Training by Melanie. Bookmark the permalink. I am an avid runner (I average about 3-4 full marathons a year along with several half-marathons and 10K races). For my very first marathon, I followed a training plan (I don’t even remember which one anymore) and I found that when someone else was telling me when to run and how far to go, it became work and I dreaded it. Since then, I have just run to run and not worried about how far I was going. Two years ago I ran my first sub-four hour marathon and couldn’t have been happier. Now, this is not to say that training plans don’t work, but I found that I resented mine. Like I said, I listen to my body, run longer runs when I feel like it (or have the time- usually on the weekends) and give myself rest when I need it. I hope this helps and good luck on your race. I already have several on my summer calendar myself! Hi Lisa, this was EXACTLY the advice I needed to hear. Thinking back to my training for a 15k last summer, I remember dreading getting out of bed Saturday mornings because I knew I HAD to a big run to accomplish even if I didn’t feel like running at all. It makes so much more sense to run when I want to run, longer runs when it feels good and I when I have time, and accommodating training to my own personal schedule. I want running to be enjoyable, not become a chore. Thank you so much for your response. If you don’t mind, I will be mentioning what you said in a post coming up! You are very welcome Melanie! I am not, by any means, an Olympic-caliber runner, by I do truly enjoy running. I have talked to a lot of people who want to enjoy running and my response is always the same. Running can be fun when it is done on your terms. I wish you all the luck in your half-marathon. I still remember my first half…crossing that finish line was an amazing moment and I hope you experience the same. Also, you are more than welcome to share my advice in your post…I love reading your thoughts and advice every day!! Mellie, what portions do you use for that overnight oatmeal/greek yogurt concoction you make?